A modern languages student graduates from Bangor University this week and will soon be heading to Zurich to teach English. 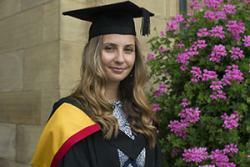 Rebecca Earnshaw, 22, form Nunthorpe, Middlesbrough graduated this week with a BA German degree. After going on school trips and exchanges to Germany and getting good marks in language classes, the former Prior Pursglove College student decided that she wanted to pursue German which she had studied since year 7. Happy to be graduating after four years of hard work, Rebecca said: “I came to Bangor because of its unique location and the very welcoming and friendly environment I experienced when visiting for open days. I remember going to the School of Modern Languages open day and leaving feeling like I would be very happy and comfortable studying in Bangor where I felt I was treat more as a person, rather than a number like at other open days I had attended. I also applied for a Merit Scholarship and sat an exam from which I won £500. “As part of my course, I had a compulsory year abroad which I spent in Detmold, Nordrhein-Westfalen, Germany. I decided to apply for the British Council English Language Assistantship to assist in teaching English in a Secondary School. I was allocated Gymnasium Leopoldinum and loved every single minute of it. I assisted in English lessons, ran extra curricular clubs and offered private tuition. The school felt I had made such good progress with the pupils that they kept me on for another month after my contract had ran out. I also received an Erasmus grant which I used to go on a German Language course with the Freie Universität Berlin for a month so I could make sure my German was up to scratch. “Back in Bangor I was selected to be a British Council Language Assistant Ambassador which involved speaking to students who are going on their year abroad and talking to them about my experiences and promoting the program. “In my second year I decided to become a peer guide. This involved welcoming new students, showing them around Bangor and solving any problems. It was a great experience and was so much fun, and as a result I won the Peer Guide of the Year award which was an absolute honour to receive. “In my final year I was head peer guide for the School of Modern Languages and I helped organise Welcome Week activities alongside the School, making sure that the activities during the week ran smoothly. Being involved with the peer guiding scheme was great fun and really helped promote a community feeling in our School from day one. “I was also involved in the Course Rep system, which was really productive in making sure students had a voice and we could ensure lecturers were aware of any problems that we were having. “I co-founded LangSoc, the modern languages society in my first year and was in the committee until the end of my second year. I was an active member of the Bangor University Mountaineering Society and the places I got to see and the things I got to do were just amazing. Along with plenty of climbing in north Wales, I went to El Chorro in Spain and Kalymnos in Greece and my experiences and the excitement had through the climbing club will stay with me forever. “My time at Bangor has been an absolutely amazing experience and without it I wouldn’t be the person I am today. My year abroad was very much a defining experience and the support I received from my School before and during my time abroad really helped everything over there run smoothly. I feel so grateful for the friends I have made and the opportunities I’ve had at Bangor and I honestly feel like I wouldn’t have had them anywhere else. I feel sad to be leaving but excited for my next challenge but I feel Bangor has prepared me well for the future and it will always have a special place in my heart.